Stage School prides itself on the fact that students will not only enjoy the learning and performance side of what we do, but also the social side. We are currently arranging our next outings for sometime in 2017. Watch this page and our monthly newsletter for updates. 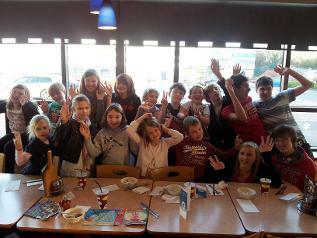 We privately hired out JJ's for 2 hours and the members who attended had a lot of fun ... even the adults! A few of our members went to London and visited a performance exhibition where they were able to get involved and perform on stage. We also visited Hamley's toy store where it appeared that teachers John and Matt had more fun than the students! Hopefully another trip will be arranged sometime in 2017.